The Stock Holding mechanic is one of the great classic mechanics in board games, dating from the golden age of design. In the Stock Holding mechanic, players are purchasing stocks in a variety of companies (or in some way that is similar to this, conceptually) which track in value up and down based on the decisions the players make in the game. These kinds of games are excellent right out of the box for game-based learning because they require the player to execute economic skills based on their own critical thinking. Each of these games is an intriguing foray into economic practice and decision making, each in its own way. Be mindful, "stock" is a somewhat flexible concept - it isn't always accurate to describe these as stock - perhaps shares might be a better way to understand it. Many of these games have very straightforward mechanics and are easy to learn but difficult to master. 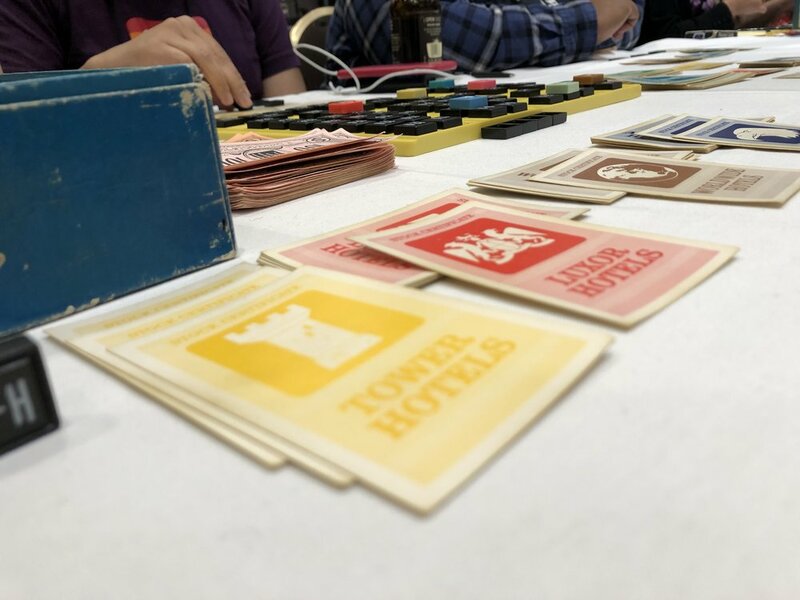 Perhaps the definitive game in this mechanic, Acquire is a game in which the players buy, trade and sell shares in hotel chains represented on the game board. As chains merge, they disappear and can reappear in new iterations. The goal is to become the majority shareholder or minority shareholder in enough large chains to make enough money to win the game. This game is a tactical masterpiece as each play of a tile on the board can radically change the direction of the game, as can each buy decision a player makes. Deservedly acclaimed as a classic. Part of Chris Handy's series of games no bigger than a pack of chewing gum, DIG is a game in which the players represent dogs digging up bones that are worth differing amounts based on how far from the dog house they happen to be. A good way to introduce younger learners to this mechanic. In Lagoon, players are taking on the roles of druids who are using their powers to manage and shift the energy balance on their world in favor of the energy they use and against the energy they oppose. The "stock" in this case represents the shifting tides of these energy forces. A bit tricky to get a handle on, but once understood, this great game is a highwire act. One of the great conceits in modern gaming is that Monopoly is a dreadful game. It's very low BGG rank would appear to confirm this. But, let me make the case for it. If Monopoly is played correctly and by its printed rules, it's a far better game than the way it's generally played. As written, Monopoly requires players to buy or auction any unowned property and doesn't provide any mechanism to add money back into the game, except through passing Go! or drawing Chance/Community Chest cards. If played this way, Monopoly is actually an interesting game of managing the title deeds, trading and auctioning. When played with money in Free Parking and all of the other "house rules," it takes a tactically interesting game and makes it a bloated mess. One of the great economic rail games, in Union Pacific players are trying to take control of various railway companies in nineteenth century America. Innovative for its time in many ways, the game remains a great example of how this mechanic works. Will you expand your strength in a company or make it more valuable?